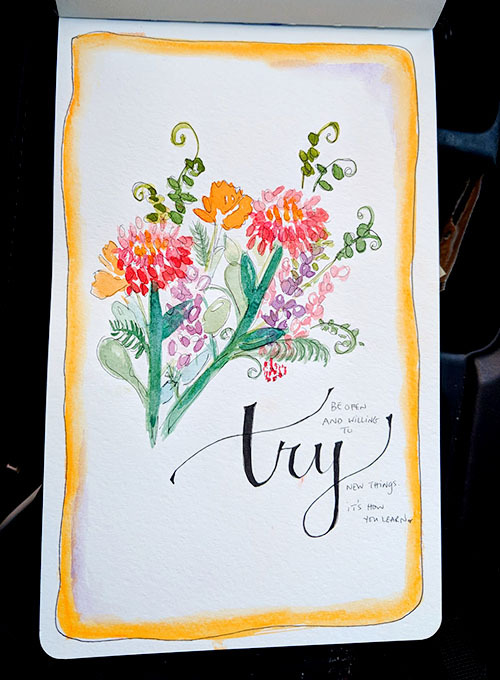 This week I wanted to share a piece of art I did thanks to a new book coming out called DIY Watercolor Flowers. I am always obsessed with being able to draw and paint flowers. I love them so much in real life that I always try to capture them in my art and can never really do them justice. Boudon’s book has three main sections: Basic Techniques, Plant Directory and Flower Compositions. The first section gives you watercolor techniques: how to overlay, how to create transparent layers, how to blend, how to contrast, etc. She also reviews brushes, papers, paint of course. Then the plant directory has: roses, peonies, carnations, dahlias, anemones, poppies, and foliage. She has small detail flowers, too. All of the steps are simple (well they look simple and of course they take a lot of practice to master.) and relatively easy to follow. The last section puts it all together with some lovely compositions. Frames, circlets, bouquets, patters, streamers, etc. This was my favorite section of course. There are step by steps but not as many as I tend to crave. Having said that, if you practice all the plants in the directory, I have no doubt you can get these bouquets. Overall this is a lovely book for people who want to start painting flowers. It’s not super advanced but it will get you started on painting flowers in no time! i had to put my own spin on it of course. It says Be open and willing to try new things. It’s how you learn. thank you to netgalley and the publisher for an advanced copy. all opinions are mine.